Pictured: Head of Claims: Trustco Insurance – Kevin Anderson, Bursary recipients, Bernice Keet, Julia Nampweya, Undjimuna Katjerungu and Head: Trustco Insurance – Annette Brand. 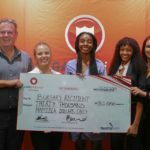 TRUSTCO Insurance, through its Legal Shield product, has devoted itself to support three University of Namibia Law students for the 2019 academic year. The students will receive financial support as well as an opportunity to conduct their Work Integrated Learning at Trustco Insurance upon graduation. This year’s recipients – Bernice Keet, Julia Nampweya and Unjimuna Katjerungu – will each be awarded Legal Shield bursaries amounting to N$30 000.00 after undergoing a vigorous selection process that took into account an array of criteria as well as personal attributes. The financial assistance will enable them to focus on their studies rather than the financial hardships one encounters when pursuing a higher education qualification. 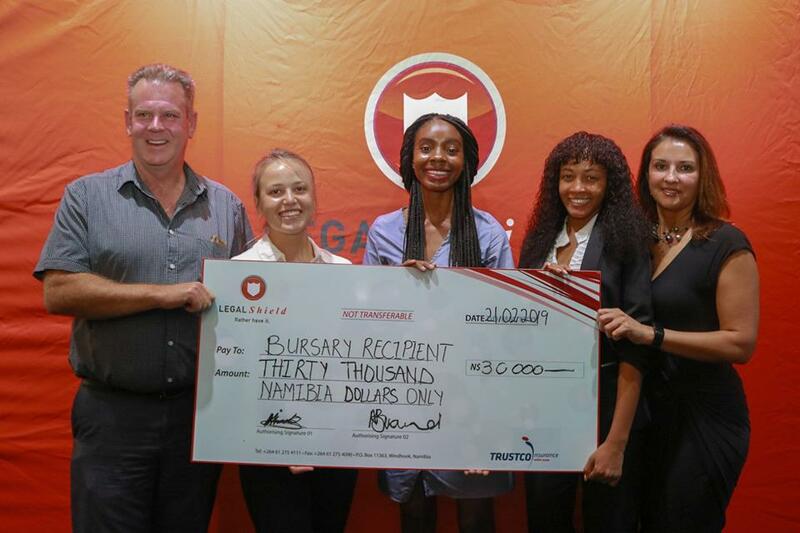 The Legal Shield bursary initiative has awarded in excess of N$1 million to numerous students since 2002. Upon completion of their studies, the three recipients will be granted the opportunity of employment at Trustco Insurance where they will each receive valuable practical experience in the legal working environment. This is to equip them for the future by enhancing their confidence in executing tasks. Trustco Insurance continues to assist law students annually by means of bursaries and employment opportunities. To date, a total of 42 bursaries have benefited from the financial assistance provided through the Legal Shield Bursary. The management of Trustco Insurance believes that investing in promising legal students is an investment in the future. Legal Shield was launched in 2000 as the only Namibian legal insurance provider. It offers affordable legal cover against costs stemming from civil, criminal, matrimonial, labour and administrative matters. The Legal Shield Bursary ceremony was attended by members of the legal fraternity, Trustco Insurance employees and the media alike.